Why do major currency moves bring increased trader losses? To find out, the DailyFX research team has looked through over 40 million real trades placed via a major FX broker's trading platforms. In this article, we look at the biggest mistake that forex traders make, and a way to trade appropriately. Why Does the Average Forex Trader Lose Money? The average forex trader loses money, which is in itself a very discouraging fact. But why? Put simply, human psychology makes trading difficult. We looked at over 43 million real trades placed on a major FX broker's trading servers from Q2, 2014 – Q1, 2015 and came to some very interesting conclusions. The first is encouraging: traders make money most of the time as over 50% of trades are closed out at a gain. 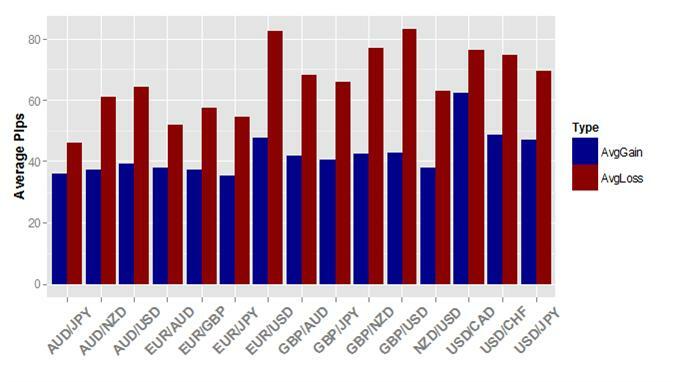 Data source: Derived from data from a major FX broker* across 15 most traded currency pairs from 3/1/2014 to 3/31/2015. The above chart shows results of over 43 million trades conducted by these traders worldwide from Q2, 2014 through Q1, 2015 across the 15 most popular currency pairs. The blue bar shows the percentage of trades that ended with a profit for the trader. Red shows the percentage of trades that ended in loss. For example, the Euro saw an impressive 61% of all trades closed out at a gain. And indeed every single one of these instruments saw the majority of traders turned a profit more than 50 percent of the time. If traders were right more than half of the time, why did most lose money? The above chart says it all. In blue, it shows the average number of pips traders earned on profitable trades. In red, it shows the average number of pips lost in losing trades. We can now clearly see why traders lose money despite being right more than half the time. They lose more money on their losing trades than they make on their winning trades. Let’s use EUR/USD as an example. We see that EUR/USD trades were closed out at a profit 61% of the time, but the average losing trade was worth 83 pips while the average winner was only 48 pips. Traders were correct more than half the time, but they lost over 70% more on their losing trades as they won on winning trades. The track record for the volatile GBP/USD pair was even worse. Traders captured profits on 59% of all GBP/USD trades. Yet they overall lost money as they turned an average 43 pip profit on each winner and lost 83 pips on losing trades. What gives? Identifying that there is a problem is important in itself, but we’ll need to understand the reasons behind it in order to look for a solution. Cut Losses, Let Profits Run – Why is this So Difficult to Do? In our study we saw that traders were very good at identifying profitable trading opportunities--closing trades out at a profit over 50 percent of the time. They utlimately lost, however, as the average loss far outweighed the gain. Open nearly any book on trading and the advice is the same: cut your losses early and let your profits run. When your trade goes against you, close it out. Take the small loss and then try again later, if appropriate. It is better to take a small loss early than a big loss later. If a trade is in your favor, let it run. It is often tempting to close out at a small gain in order to protect profits, but oftentimes we see that patience can result in greater gains. But if the solution is so simple, why is the issue so common? The simple answer: human nature. In fact this is not at all limited to trading. To further illustrate the point we draw on significant findings in psychology. What if I offered you a simple wager on a coin flip? You have two choices. Choice A means you have a 50% chance of winning 1000 dollars and 50% chance of winning nothing. Choice B is a flat 450 point gain. Which would you choose? Over time it makes sense to take Choice A—the expected gain of $500 is greater than the fixed $450. Yet many studies have shown that most people will consistently choose Choice B. Let’s flip the wager and run it again. In this case we can expect to lose less money via Choice B, but in fact studies have shown that the majority of people will pick choice A every single time. Here we see the issue. Most people avoid risk when it comes to taking profits but then actively seek it if it means avoiding a loss. Why? Nobel prize-winning clinical psychologist Daniel Kahneman based on his research on decision making. His work wasn’t on trading per se but clear implications for trade management and is quite relevant to FX trading. His study on Prospect Theory attempted to model and predict choices people would make between scenarios involving known risks and rewards. 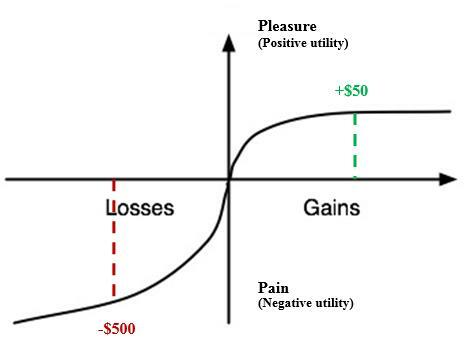 The findings showed something remarkably simple yet profound: most people took more pain from losses than pleasure from gains. It feels “good enough” to make $450 versus $500, but accepting a $500 loss hurts too much and many are willing to gamble that the trade turns around. This doesn’t make any sense from a trading perspective—500 dollars lost are equivalent to 500 dollars gained; one is not worth more than the other. Why should we then act so differently? Taking a purely rational approach to markets means treating a 50 point gain as morally equivalent to a 50 point loss. Unfortunately our data on real trader behavior suggests that the majority can’t do this. We need to think more systematically to improve our chances at success. Avoiding the loss-making problem described above is very simple in theory: gain more in each winning trade than you give back in each losing trade. But how might we do it concretely? When trading, always follow one simple rule: always seek a bigger reward than the loss you are risking. This is a valuable piece of advice that can be found in almost every trading book. Typically, this is called a “reward/risk ratio”. If you risk losing the same number of pips as you hope to gain, then your reward/risk ratio is 1-to-1 (also written 1:1). If you target a profit of 80 pips with a risk of 40 pips, then you have a 2:1 reward/risk ratio. If you follow this simple rule, you can be right on the direction of only half of your trades and still make money because you will earn more profits on your winning trades than losses on your losing trades. What ratio should you use? It depends on the type of trade you are making. We recommend to always use a minimum 1:1 ratio. That way, if you are right only half the time, you will at least break even. Certain strategies and trading techniques tend to produce high winning percentages as we saw with real trader data. 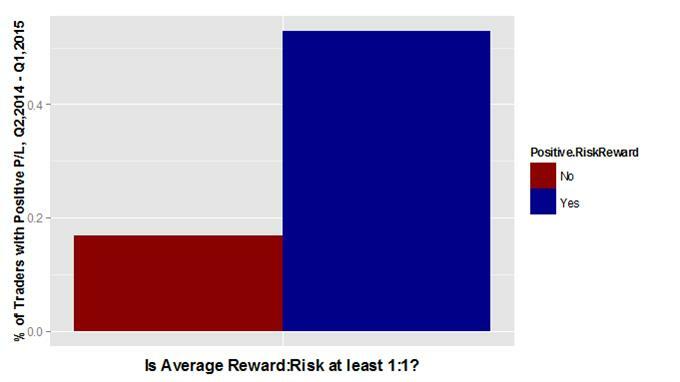 If this is the case, it is possible to use a lower reward/risk ratio—such as between 1:1 and 2:1. For lower probability trading, a higher reward/risk ratio is recommended, such as 2:1, 3:1, or even 4:1. Remember, the higher the reward/risk ratio you choose, the less often you need to correctly predict market direction in order to make money trading. We will discuss different trading techniques in further detail in subsequent installments of this series. Once you have a trading plan that uses a proper reward/risk ratio, the next challenge is to stick to the plan. Remember, it is natural for humans to want to hold on to losses and take profits early, but it makes for bad trading. We must overcome this natural tendency and remove our emotions from trading. The best way to do this is to set up your trade with Stop-Loss and Limit orders from the beginning. This will allow you to use the proper reward/risk ratio (1:1 or higher) from the outset, and to stick to it. Once you set them, don’t touch them (One exception: you can move your stop in your favor to lock in profits as the market moves in your favor). Managing your risk in this way is a part of what many traders call “money management”. Many of the most successful forex traders are right about the market’s direction less than half the time. Since they practice good money management, they cut their losses quickly and let their profits run, so they are still profitable in their overall trading. Does Using 1:1 Reward to Risk Really Work? Our data certainly suggest it does. 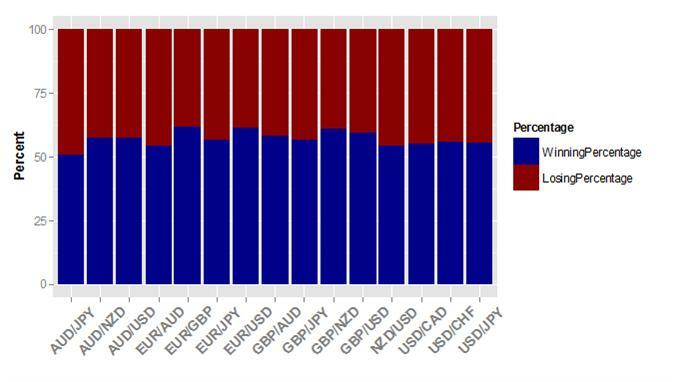 We use our data on our top 15 currency pairs to determine which trader accounts closed their Average Gain at least as large as their Average Loss—or a minimum Reward:Risk of 1:1. Were traders ultimately profitable if they stuck to this rule? Past performance is not indicative of future results, but the results certainly support it. Our data shows that 53 percent of all accounts which operated on at least a 1:1 Reward to Risk ratio turned a net-profit in our 12-month sample period. Those under 1:1? A mere 17 percent. Traders who adhered to this rule were 3 times more likely to turn a profit over the course of these 12 months—a substantial difference. Game Plan: What Strategy Can I Use? Whenever you place a trade, make sure that you use a stop-loss order. Always make sure that your profit target is at least as far away from your entry price as your stop-loss is. You can certainly set your price target higher, and probably should aim for at least 1:1 regardless of strategy, potentially 2:1 or more in certain circumstances. Then you can choose the market direction correctly only half the time and still make money in your account. The actual distance you place your stops and limits will depend on the conditions in the market at the time, such as volatility, currency pair, and where you see support and resistance. You can apply the same reward/risk ratio to any trade. If you have a stop level 40 pips away from entry, you should have a profit target 40 pips or more away. If you have a stop level 500 pips away, your profit target should be at least 500 pips away. We will use this as a basis for further study on real trader behavior as we look to uncover the traits of successful traders. *Data is drawn from FXCM Inc. accounts excluding Eligible Contract Participants, Clearing Accounts, Hong Kong, and Japan subsidiaries from 3/1/2014 to 3/31/2015. Over the past several months, The DailyFX Research team has been closely studying the trading trends of traders via a major FX broker. We have gone through an enormous number of statistics and anonymized trading records in order to answer one question: “What separates successful traders from unsuccessful traders?”. We have been using this unique resource to distill some of the “best practices” that successful traders follow, such as the best time of day, appropriate use of leverage, the best currency pairs, and more. Stay tuned for the next article in the Traits of Successful Traders Series. Learn forex trading with a free practice account and trading charts from IG.